Our Quality Control team are responsible for ensuring that the packets of seeds leaving our factory do so in tip-top condition. Led by Drina Nunes, their mission is to check everything. From the seed quality, to the correct amount in each packet, that any sealing is secure and that the information given on the pack is correct. Millions of packets of seeds are produced here at Suttons each year. There are hundreds of flower and vegetables species on offer across our range, and there are multiple varieties of most types. The set up in the machine room which produces our packets is a miracle of organisation, and Drina keeps an eye on the quality of all of those packets. She not only has customer satisfaction at the top of her list, but also protecting the reputation of the company as a whole. Each job that goes on a machine will be checked for correct seed, packets, date and fill. The measure of seed is checked, and the seeds are counted where there is a stated quantity. The integrity of the hermetically sealed foil inserts or packet seals are tested, as are any glued areas, and paper packets are scrutinised for imperfections too. The motto of this department is ‘Get it right’, and it works. However, once in a while a problem does occur, and this is where the detective work begins. Trouble shooting requires locating the root of the problem and the whole process needs to be traced back until the fault can be found, fixed, and changes made to ensure that it doesn’t happen again. They'll also pick up other problems such as infestations or the presence of weed seed, working hand in hand with our all important on site laboratory. The lab is the final piece of the quality picture, run by David Keep who has many years of experience. he came to Torquay from Reading with the company in 1976. 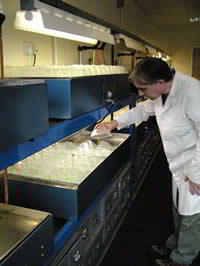 The role of the lab is to check for purity and germination rates. This is particularly important with scheduled vegetables that, by EU regulations, have to be above 80% germination. The production of seed as a crop is fraught with difficulties and we have to take these possible problems into account before the packing operation takes place. In open fields there will be weeds and rogue plants that appear and can, unfortunately, be harvested with the main crop. The resulting seed crop can be contaminated by these ‘rogues’ that have established themselves in the field to a lesser or greater extent. This is where the purity checks are so important, as there are strict regulations regarding this in law too. Samples are taken and checked - a painstaking and time consuming job. As well as rogue seed, there could be a great deal of detritus or broken seed. The presence of any of these will mean the seed batch is sent back to the supplier. Dried seed is checked for moisture content – there is a delicate balance between the seed being dry enough for dormancy, but not too dry which may kill the seed. Too much moisture means that the seed will either try to shoot, or just rot in the packet. Another problem can be the presence of grubs, beetles or moth larvae. Larger seeds like peas and beans, sweet peas and nasturtiums are often the carriers. An accelerated test, where a sample in a sealed plastic container is subjected to a temperature of thirty degrees, will encourage any stow-away to make an appearance. 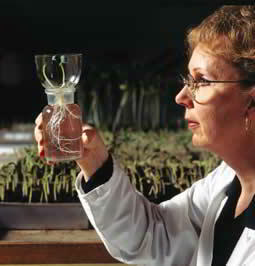 The lab is also where our primed seed is produced. The pre-germinated seed of cucumber is offered as an alternative to gardeners as an alternative to trying to germinate their own. Cucumbers can be tricky and subject to damping-off at an early stage, so the primed seed has already been given a head start in perfect conditions for a stronger seedling. Between the Trial Grounds, Quality Control and the laboratory, we are confident that our products are of the highest quality. However, even under the eagle eyes of these departments, with millions of packets produced annually some things inevitably go wrong, and that is where the guarantee comes in. If our customers are dissatisfied in any way with their condition and let us know within 14 days we will replace or refund immediately.